Where the Streets Have No Name: Primitively constructed logging roads may end up as public thoroughfares like King's Creek Road above Boulder Creek. Forest preservation isn't just about protecting redwoods. The biggest threat in the woods comes from the mudslides and floods brought by logging roads. WE ARE SLIPPING and sliding along the mud-slicked back roads above Boulder Creek, home to some of Santa Cruz County's more spectacular landslides, torrents of debris and general mayhem kicked up by the recent El Niño storms. The four-wheeler groans its way in low gear, trying to negotiate a particularly treacherous piece of King's Creek Road. Like virtually all county roads, King's Creek Road was originally a logging road, designed to haul out redwoods to nearby mills. It is only paved for the first couple miles, then graveled; it finally dwindles to a god-awful soup of Teflon-slick mud. The tires flirt menacingly with precipices. The view, when my two companions and I are courageous enough to remove our eyes from the road, is both breathtaking and--if you know what to look for--heartbreaking. Ten to 50 feet below us on the left gurgles the creek from which the road takes its name. Miniwaterfalls crest over boulders and splash into eddying pools as King's Creek winds through the redwood forest, eventually flowing into the San Lorenzo River. Yet the mountainside--both to our right and to the left, rising from the opposite side of the creek--is striated with slides and debris-choked "chutes." Similar slides lacerate hillsides throughout the county. To the untrained eye, they are merely organic fallout from nature's fury. But Santa Cruz County environmental planner Dave Hope sees nothing "natural" about much of the damage. He echoes an opinion widely held among geologists, biologists and even foresters that disastrous erosion problems stem from an estimated hundreds of miles of both new and abandoned logging roads and illegally constructed roads that snake throughout Santa Cruz County. While many environmentalists are still pointing the finger at logging as one of the culprits causing damage throughout the ecosystem, they're only partially right. It's not just tree removal, says Sam Herzberg, an environmental resource planner in San Mateo County, but also the paths that bring them out that are responsible for choked watersheds, a threatened coho salmon and steelhead population and ground destabilization that endangers homes and lives. And even though forestry practices have supposedly become stricter in the past decade or so, there is a growing chorus of voices saying that not nearly enough is being done to slow an inevitable decline in Santa Cruz's most precious resource: its fragile ecosystem. THE HISTORY of Santa Cruz County and its growth is inextricably linked to its redwoods. The towering Sequoia sempervirens is only found in one place on earth--a thin band running along the California Coast from the Oregon border to San Luis Obispo. Prized as a source of durable and beautiful building material, the huge, ancient redwoods were virtually decimated in this county. Hope estimates that there is less than 4 percent of the old-growth--also known as first-growth--redwoods left today in Santa Cruz. "And as we speak," he says, "they are dropping that, too." Herzberg also knows the history of logging in these Santa Cruz Mountains. "There were two major periods of harvesting, and in both cases, they were clear-cut," he explains. The first followed the 1906 earthquake. Oxen pulled the logs down makeshift trails to the creek or railroad bridges. Historical photos show barren mountainsides stubbled with a five-o'clock shadow of stumps. Herzberg believes that the most damage was done when the post-WWII building boom required massive amounts of timber for the suburban housing explosion. "During that period of logging, there were a lot of roads created by tractors, roads right down to the creeks that caused a lot of soil destabilization," he says. Giant earth-moving equipment carved huge gashes 50 or 60 feet wide through the mountains. Roads served one purpose--to get the timber out faster, easier and cheaper. But what those earlier folks didn't know is that their method of road construction was about as natural and friendly to the environment as their chain saws were to the redwoods. Part of the problem lies in the soil found in the Santa Cruz Mountains. Naturally erosive, it provides a perfect medium for landslides. 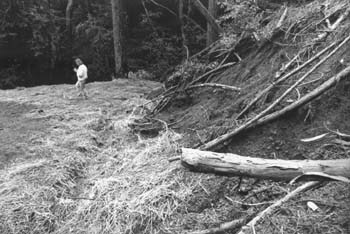 As David Bayles, conservation director of the Oregon-based Pacific Rivers Council, explains, there are different types of landslides. The type that Santa Cruz is known for--shallow, fast-moving landslides--finds an interesting, though unequal, equation with logging roads. 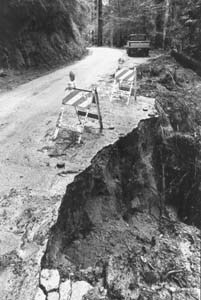 "Not all roads cause landslides," Bayles says, "but every scientific study has found that roads radically accelerate the rate of this type of landslide." The aquatic conservation group Bayles works with now tracks the relationship of development and timber harvesting affects the health of the nation's watersheds. He agrees that the roads are a primary culprit in causing erosion and sediment runoff to the streams. Like King's Creek Road, many logging roads run right alongside or into waterways, offering a perfect channel for dumping sediment and debris. By interrupting the natural drainage flow, roads allow water, debris and dirt to collect both velocity and mass as they speed toward the once-pristine waters. Although landslides and erosion will naturally occur during heavy rainstorms, the proliferation of logging roads makes a significant difference. One powerful storm can now choke a stream with an amount of sediment equivalent to what it used to take 100 (or 1,000) storms to do, Bayles says. According to studies released by the American Fisheries Society, the sediment from road construction is much greater than that from all other land-management activities combined. And the effects of roads on certain species of fish, like the coho salmon, are devastating. "The decline in coho is in most areas 95 percent," Bayles says. "In the worst area where they're still alive, it's 99 percent." Don Alley, a Santa Cruz fisheries biologist and environmental consultant, concurs that the local population of coho faces a grim situation. "They're essentially gone from San Lorenzo and Soquel Creek," he observes. But Alley will not go as far as Bayles in assigning percentages, since he believes the data on the original numbers of both species are either flawed or incomplete. Alley also notes that logging is only one of several factors that are threatening the coho. THERE IS NO disagreement, however, that logging is indeed having a severe effect on the cohos' spawning ground. It is not only the roads, Alley emphasizes. "The loggers also have something called a skid trail, made where tractors drag dead trees through the forest," he explains. "They're not called roads," Alley continues, "but the effect is the same. [Loggers] try to pack it down with slash, so it looks like a road that has a bunch of tree branches on it. It will do better than a regular road, but still, it will change the drainage pattern." Alley describes the delicate and intricate tapestry of biological interdependence that timber harvests, their roads and their skid trails leave in tatters. "The sediment runoff destroys spawning grounds by smothering suitable spawning redds [nests for coho and steelhead], changing the depth of water and choking out oxygen-rich water," Alley explains. As the pool depths become shallower from silt buildup, fingerlings are further exposed to birds and other predators. The cracks and crevices of rocks that provide habitat to insects also fill with sediment, destroying a major food source for fish. The destruction continues--and not just to fish--when trees are harvested or roads are built in the riparian corridor. "Ninety percent of the animals that live in the forest use that riparian corridor," Alley says, referring to the natural habitat surrounding waterways. When it comes to identifying the problem, Alley is willing to repeat what many other biologists will say only off the record: "The CDF [California Department of Forestry and Fire Protection] doesn't do a good job of protecting the fish habitat. My impression of CDF is they're there just to facilitate logging." Dennis Orrick, the CDF's timber harvesting plan administrator in Sacramento, admits that his agency facilitates timber harvesting, but he adds a caveat: "Our mandate is to approve timber-harvesting activities--but to mitigate them first." 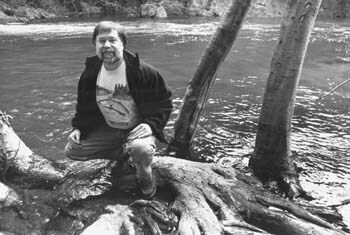 He disagrees that the CDF fails at protecting the aquatic habitat, pointing out that the rules his agency enforces to mitigate damage from logging were developed by the Board of Forestry with input from the California Department of Fish and Game, as well as from other wildlife agencies. "It's pretty much an accepted fact that on logging operations, roads are the biggest contributors to sediment," Orrick says. "So that's where you try to do most of your mitigation." But conservationist Bayles doubts that even drastic measures in road building at this point could make an immediate difference in the health of our watersheds. "Road building puts sediment in streams that takes decades--or centuries--to remove," Bayles says. "The harm that occurs to water quality, to streams and to endangered coho salmon is harm that will take a long time to reverse." Older logging roads pose yet another problem--they didn't just stay logging roads. According to Hope, most of the 600 miles of county-maintained roads and highways began as logging roads. Although that figure includes all the familiar Santa Cruz byways, Hope points to King's Creek Road as a prime example. Built close to the creek, it now serves as throughway to homes as well as to a Boy Scout camp, two retreat centers and numerous logging projects that continue to this day. Hope estimates that about 20 percent of the watershed has been logged in the last 10 years, and more plans are on file today. Each car, each truck, each redwood-loaded semi that passes pushes more soil down the ravine to the waters below. Alley Oops: Fisheries biologist Don Alley blames the CDF for not enacting forestry regulations stringent enough to protect the fish habitat. THEN THERE IS the legacy of El Niño. About a mile up King's Creek Road, there is a creek bed that cuts perpendicular to the road, allegedly assisted on its journey by a two-foot culvert beneath the road. The culvert may have worked well in a gentle sprinkle, but the recent storms turned this creek bed into a potentially deadly "debris chute." Each side of the creek is sluiced almost 20 feet deep in some places, where a greased path of mud and debris scoured the ravine clean of any vegetation. On the other side of the road, a telephone pole is impaled in the side of the hill, a frightening reminder of the 40-mph torrent of collected logs, slash and debris that pulsed over the road to the other side during one particularly nasty storm this winter. Like the road, the culvert that the torrent ignored was put in long, long ago. And like the road, it is one more testament to harebrained designs in the face of Mother Nature. "Culverts are just like a straw," says engineering geologist Tom Spittler, who works with the California Department of Conservation in its division of mines and geology. "And it's not hard to plug a culvert." Built to carry water under roadways, culverts often don't when they most need to. "Steel culverts will rust, aluminum culverts will abrade and all will plug," states Spittler. His answer to culverts is to avoid constructing them in the first place. "A culvert is high maintenance," he continues, "and even so, it fails after 20 years." Culverts also add to the struggles of the already beleaguered migrating steelhead and salmon. Either the culvert is too high to leap up or the water on the other end is too shallow to leap down--or drought periods create passage barriers. Spittler notes that fewer culverts are being proposed nowadays with logging roads. Hope notes that while logging roads contribute about 80 percent of the problems, illegally constructed roads fill in the other 20 percent of the county's already overloaded schedule of patrolling damage from roadways. "People have constructed them without grading permits, and the roads are not for permitted purposes," Hope says. He pauses for a moment, trying to find a way to define the outlaw graders: "What they are is cowboys and their cats [caterpillar tractors]--it's a boy thing." Those roads are clearly illegal. The real problem comes when the road is deemed legal. Today's construction of logging roads may be a far cry from the regulation-free era of a half-century ago. The 50-foot-wide behemoths have been banned, and road widths are mainly kept to about 12 or 14 feet. Building codes mandate that drainage paths are to be built in and that roads should follow the natural contour of the land when possible. But what should be and what actually is often differ widely. Timber harvesters may petition to use an old existing logging road--even though it runs creek-side--arguing that it will cause less damage than constructing a new one. It is, of course, also much cheaper for the logging company. Then again, timber harvesters may construct a relatively well-made low-impact road for their logging trucks. But it doesn't solve the problem shared with culverts: roads require maintenance. Under current CDF rules, timber harvesters are only responsible for the harvested area--including its roads--for three years after the logging is completed. "We have a lot of permanent roads constructed under temporary standards," Hope explains. "The standards [for logging roads] are much lower because they're not used every day by school buses full of children, so the basic construction is primitive." After three years, what is left is the permanent remainder of a temporary solution. Each year sees a few more miles of dirt road strung through the redwoods, roads that, for the most part, will be abandoned. Or at least until the next logging project comes along. Timber giant Redwood Empire is under continuing attack for questionable logging practices in Gamecock Canyon. COUNTRY ROADS, logging roads and private roads all scatter from King's Creek Road like cracks in a mirror. Firmly entrenched, there is no turning back the clock for this network that sprouted from of a poorly placed logging road. But conservationists say that plenty can be done about newly constructed roads and skid trails--if those who govern forest standards would wise up and take a stand. The answer, they say, is simple, though not easy: either increase the timber industry's responsibility to maintain the logging roads for the duration or "put them to sleep," tree-jockey parlance for restoring roads to their natural contours and allowing them to go dormant. "We go out in the field and see a lot of old logging roads in really bad shape," Herzberg explains. "I try to get the CDF to require that these be put to sleep. It's feasible, but it may be expensive." In Herzberg's opinion, timber operators ought to be held to the same standards as those who improperly care for hazardous waste. "The current forestry regulations don't address past practices," he adds. "But it should be like hazardous waste, where you're required to go back and fix the problem." Orrick doesn't see that happening. "Once the timber harvesting is over, we're out of the picture," he says. But he also sounds a cautionary note for those quick to condemn logging roads and logging in general: "I would hazard to say that there are fewer problems from logging roads than [from] private-access roads. If you had to attribute the loss of habitat in Santa Cruz County, it's not logging, it's development. "In some respects, the more uneconomical you make logging, you pay a price," Orrick continues. "The landowner will sell his land for development. Unfortunately, Santa Cruz County is a prime example of how people have decided to make money off their property [by development instead of timber harvests]." Orrick paints a benign picture of small local landowners taking a few trees out of their back yard. Yet CDF records offer a far different portrait. In 1996, absentee landowners accounted for more than 80 percent of the total acreage for which timber-harvest permits were filed in this county. The amount of timber harvested has quadrupled in the past 10 years--27 million board feet were logged out of Santa Cruz County forests in 1996. Some absentee owners, Redwood Empire in particular, have weathered a storm of criticism for their logging practices. Yet other timber harvesters have gained a reputation for a more environmentally sensitive approach to their business. Herzberg points to Santa Cruz-based Big Creek Lumber, which is making efforts to undo the damage of previous timber harvesters. "Big Creek is logging in Butano [Creek watershed]," Herzberg notes, "but they are also doing a lot of restoration. They're pulling out collapsed bridges and culverts, replanting and trying to restore drainages. They're taking trees out, but they're also restoring the land." Whether more timber harvesters will take voluntary measures to maintain and restore an environment abused by logging roads remains to be seen. Healthy watersheds demand three things when it comes to roads: that fewer of them are constructed, that existing ones are continually maintained and that unused ones are put to sleep. Unfortunately, those efforts don't come cheap. "In order for all these things to pass, our lumber is going to have to be more expensive," says Alley. "But that's going to have to happen if we're going to take care of our aquatic animals." And their neighbors, it appears. From the April 16-22, 1998 issue of Metro Santa Cruz.